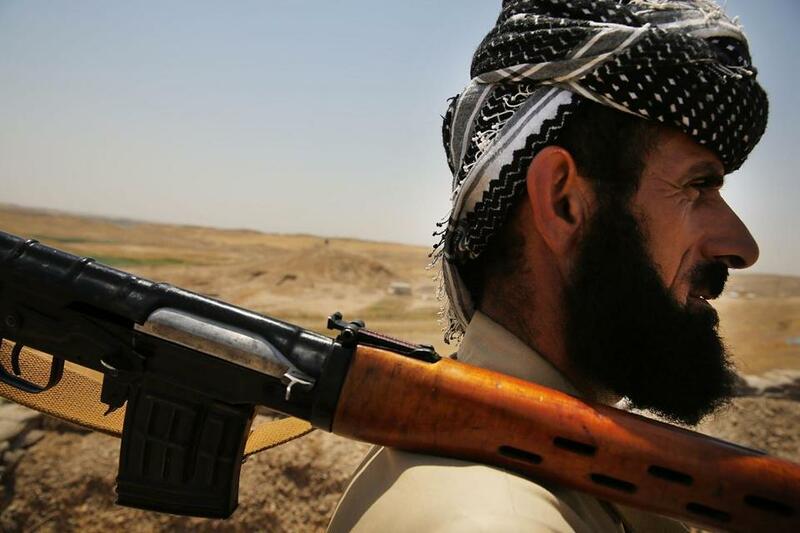 A soldier with the Kurdish peshmerga paused at an outpost on the edges of Kirkuk in Iraq. Horrific conflicts are shaking the Middle East, and war has erupted in Eastern Europe. The United States seems unable to shape the course of events. This is despite the fact that we have by far the most powerful military in the world. Today’s conflicts illustrate the declining value of conventional military power. For many decades, the United States dominated the world mainly because we had the most potent military. We still do — but that no longer brings the dominance it once assured. For much of history, power has been won on the battlefield. Victory depended on your army. If it was bigger, stronger, and better led than the enemy, you would probably win. That charmingly simple equation is now evaporating. In the emerging new world, cultural forces and webs of global politics and economics bind nations together in ways that make the exercise of military power more difficult. The idea that a big power can easily stop, win, or decisively intervene in an overseas conflict by applying massive force is a relic of past centuries. Potent armies are less valuable than they once were. This is naturally troubling for the United States. No one wants to see the value of a principal asset decline. Our military, however, is best prepared to fight the kind of battles that are no longer fought. It is a truism that generals are great at fighting the last war. Something similar could be said of American security policies: They address past challenges, which are easy to see, but not the more complex ones the future holds. Nowhere is this clearer than in Iraq. A violently anti-American force has seized a huge part of the country, and the state itself may be on the brink of collapse. The United States, with all its military power, sits helplessly on the sidelines. This is not because of fecklessness in the White House. It is because in Iraq, as in many other places, our military power could achieve only short-term success at best. In fact, it was our use of military force that helped produce this disaster. Our invasion in 2003 not only failed to produce victory in Iraq. It set off processes that led, among other things, to a palpable decline in our global power. Another vivid example of the limited value of military force is now unfolding in Gaza. Radicals there, armed with rudimentary weapons, have dragged the mighty Israeli army into a bloody conflict. They win strength — and blacken Israel’s name in the world — even as they suffer inevitable defeat on the battlefield. Israel clings even more fervently than the United States to the dangerously outmoded view that countries can guarantee their long-term security by military means alone. The United States has not won a war since 1945 — unless you count the defeat of Grenada in 1983. Despite the application of huge resources, and enormous sacrifices in blood and treasure, we lost major wars in Vietnam, Iraq, and Afghanistan. This is despite the fact that by conventional standards, our military is the world’s best. Tradition, inertia, and the natural impulse to cling to old certainties all contribute to America’s refusal to confront the declining value of our prized military. Something else also drives it: the defense industry. Military contractors have mastered the art of applying campaign contributions to gain political influence. They habitually divide major projects into pieces so that powerful members of Congress depend on them not just for contributions, but for employment in their districts. This naturally discourages the posing of questions about the true value of projects like the F-35 fighter jet, which is to cost taxpayers an eye-popping $1.45 trillion over the coming decades. Centuries ago Christopher Marlowe asked, “What are kings, when regiment is gone,/But perfect shadows in a sunshine day?” It is a fit question for the modern United States. We are accustomed to being something like kings of the world, but our regiment is now — not gone, but weakened. The decreasing value of armies threatens our standing in the world. Given this reality, how can we prevent ourselves from fading like shadows? How can we influence the world when the instrument we wield best — military force — no longer allows us to impose our will? Successful countries of the 21st century will be those that are skillful at public diplomacy, cultural politics, and alliance-building. In the past, because of our military power, we have not had to develop those skills. We will have to learn them if we hope to project power in the future.